This fact may surprise you as much as it surprised me: Which two (yes, only two) instruments today are truly American inventions? I'll give you a hint—one is the Banjo. The other is not, in fact, the Sousaphone, or the Saxophone, or a Seussian Symphonophone, although the latter is stunningly close. The only other truly American instrument is the theater organ. I'm walking up a narrow one-way street, gazing up at Lowell bell tower in Harvard. It's about 9 on the dot, so I'm early, and pull out a book to read. In about 10 minutes, everyone else would materialize, sort themselves into cars, and be off on their way to Groton, Massachusetts. The object of today's excursion is the Wurlitzer organ in Shanklin Music Hall. There's a tremendous amount of history connected to those names, dozens of volumes worth, but rather than simply reading about it we will get to experience the continuation of that history, firsthand. Shanklin Music Hall is hard to find by gps. It lies right on the border between two towns, and internet map services invariably point to some random spot in the middle of the woods a mile and a half away. (The sure- fire way to give directions, we were later told, is to provide the address for the neighboring building that is not in Groton, with the caveat to then go one door down.) The car I was in with Laura and Emerson nearly missed it: after some back-and-forthing due to said gps shenanigans, we decided to venture a bit further down the road than we had before, and about a minute later Laura suddenly shouts “SHANKLIN!”, throws the wheel hard right, and bob's-your-uncle, there it was! Truthfully, in contrast with such an exciting fast-and- furious moment, the exterior of the hall was underwhelming. It began life as something like a pole barn, and so the unassuming exterior belies the exceptional within. 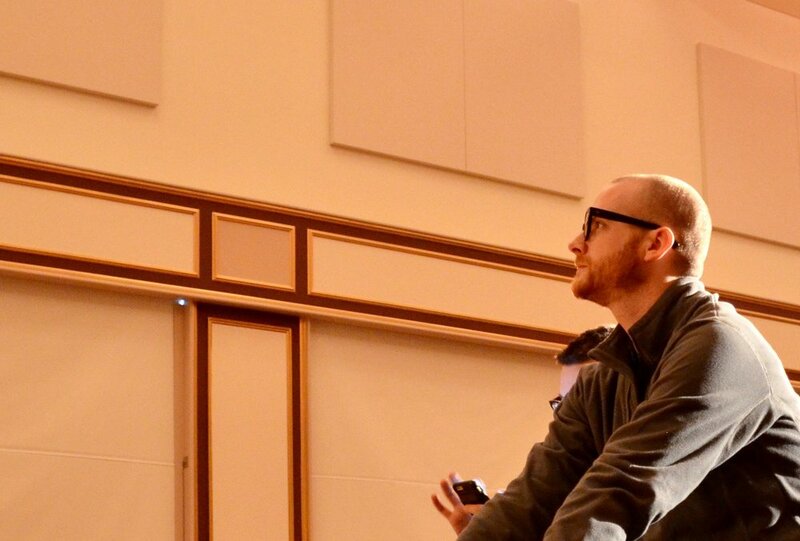 We are greeted by Norm Shanklin, who leads the non-profit, and Jonathan Ortloff, organ-builder and theater organist. Mr Shanklin began by explaining the history of the hall and the organ. 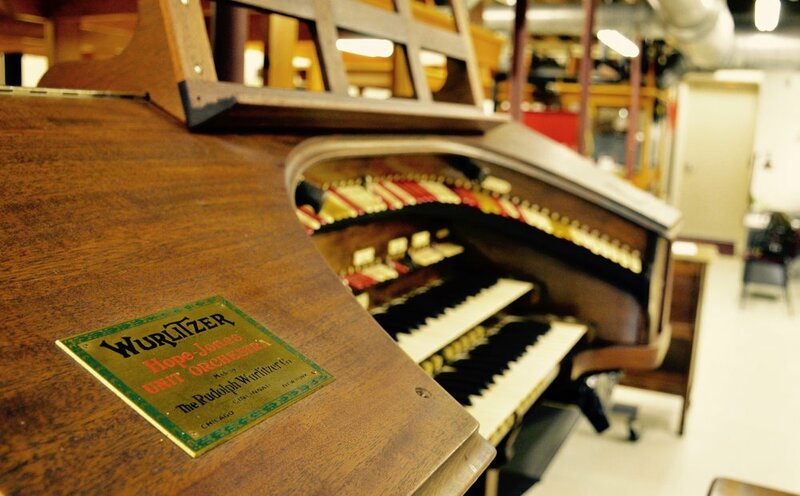 His father, a fellow MIT man, loved the sound of the theater organ and the challenge of setting one up; the magnificent instrument we see today grew out of a Wurlitzer they had installed in their home. It was the venue of ATOS* concerts and private parties, but as the size of the crowds grew, the house became cramped (“standing room only”), and so the Shanklins decided to build this hall for the organ and the social gatherings that revolved around it. The shoebox-shape of the hall takes its cues from the Musikverein in Vienna, with a roughly a 2:1:1 ratio, and it has a convex back wall to disperse sound. Up in the balcony, behind stretched cloth, are sheets of lead and rubber — serving as baffles to soak up the bass. Along with strategically-placed carpet, they cut the reverb time of the hall from 8 seconds (fine for a cathedral) to 1 1⁄2 seconds (perfect for a theater organ). Jon got up next and demoed for us. After he had finished, he explained that theater organ music is very rarely written down; almost invariably, each performer has his or her own arrangements. He then walked us through the process, with the disclaimer that the process he was describing in five minutes took as long as five weeks. 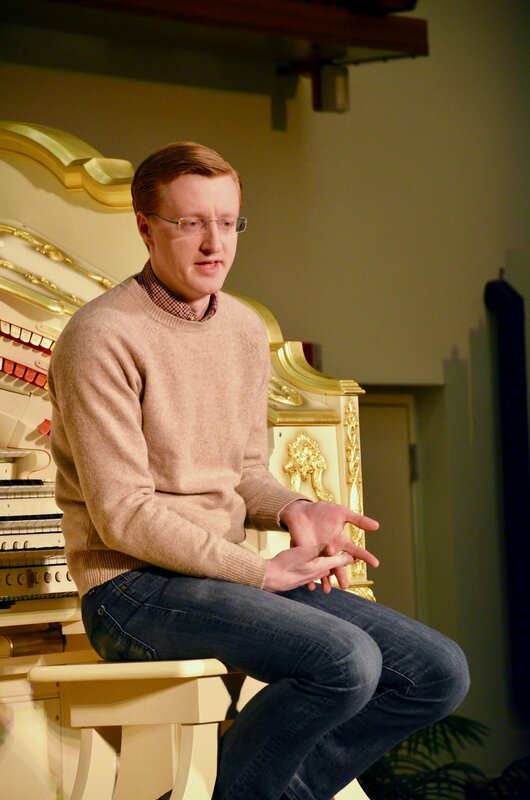 He also spoke about the theory of the theater organ. Perhaps the greatest distinguishing feature of these instruments is near total “unification”—using electrical relays to play one stop at multiple pitches from multiple manuals. Every pipe, in some sense, does double- or triple- or quadruple- or quintuple-duty (or so on). 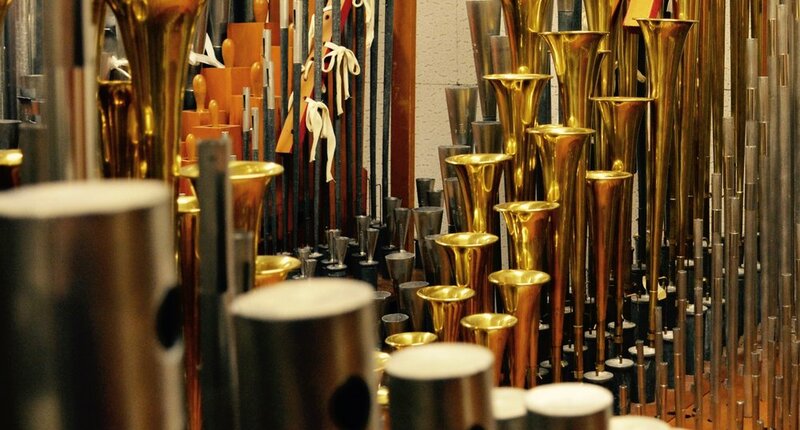 It classical organ-building theory, you'd have a separate rank of pipes for each pitch that you wanted. Although this requires many more pipes, it guarantees that the sound is consistent and balanced. 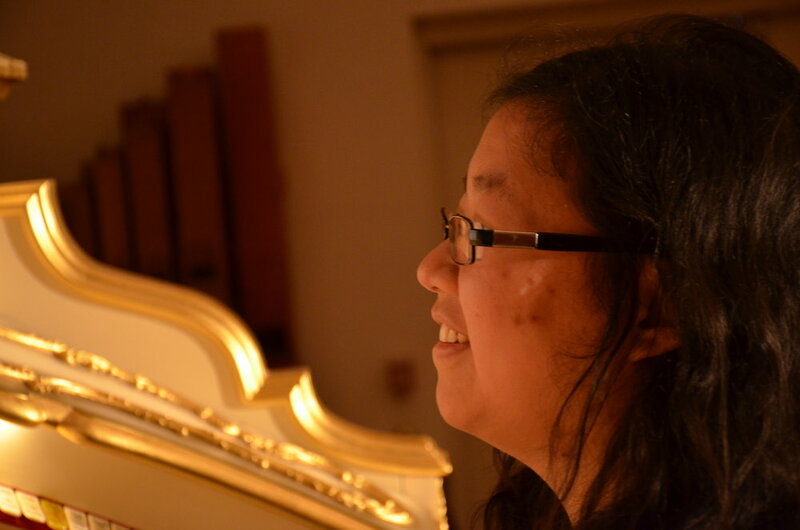 However, in the theater organ, the effect is part of the aesthetic. As a result of this system, a few thousand pipes that might require a few dozen stop knobs on a classical organ might correspond to two hundred or more stop tabs on a theater organ. After this, we had an opportunity to play. For me, it was both satisfying and addicting. I ordinarily feel a little guilty for playing film scores or popular music on a church organ, but a theater organ handles it deftly and naturally (for obvious reasons). It was so much fun. Once most of us had had a go, we ventured behind the front wall. Here we saw the electronic switching of the organ. This is the only non-original part of the instrument, but admissible because it has nothing to do with how the organ sounds, but has everything to do with how well it plays. Historically, the switching (that is to say, the mechanism that connects the console to the pipe valves) was done by electromechanical or electropneumatic relays. Robert Hope-Jones, who invented most of the technologies and stops unique to the theater organ, originally worked on telephone circuits, and transferred those skills to organ building. As an organ-builder, he was abysmal, but it was when he sold his ideas to the Wurlitzer company that magic started happening. 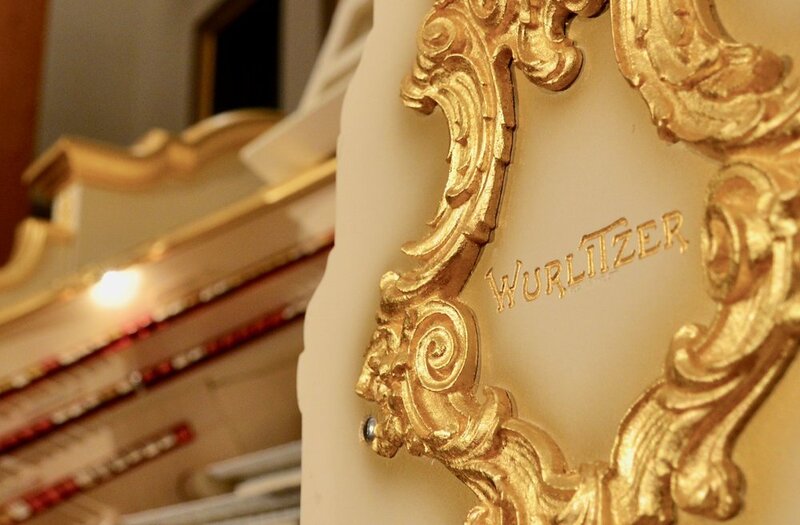 Wurlitzer had it golden years in the beginning of the 20th century; at their height, they were manufacturing and shipping one organ every day. 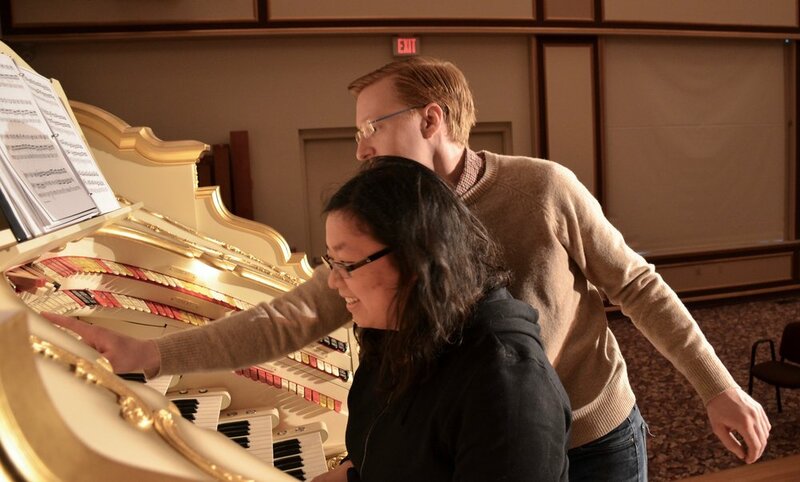 With the exception of the Trumpet-en-Chamade and a 1927 Mason & Hamlin / Ampico Model RBB piano, every stop and chest in the Shanklin Music Hall organ is original Wurlitzer. Parts have been meticulously restored, making possible the preservation of this wonder for decades more to come. It is, in so many ways, exceptional. While within the front of the building, we also took a glance at the blower (also original!) and the pipe chambers. The chambers are spacious, climate-controlled, well-lit, and utterly clean. I can not tell you how rare it is for pipe chambers to be spacious. 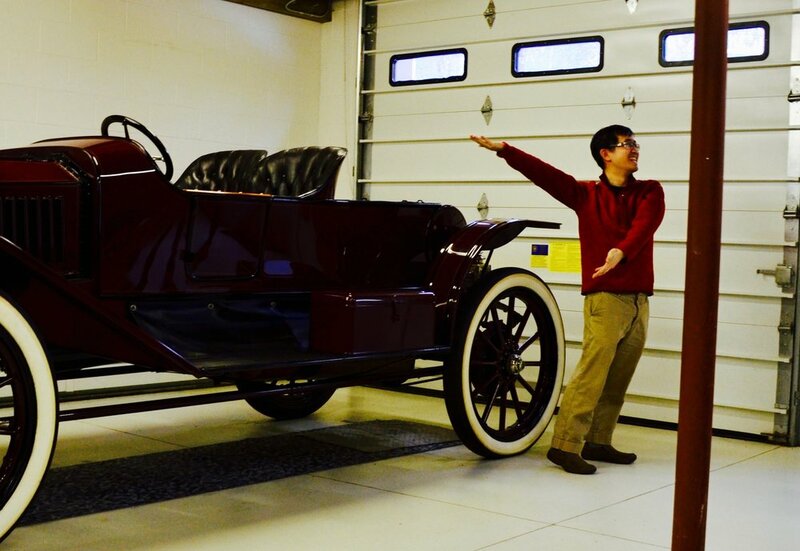 We got to see a diaphone—which has been a small dream of mine for years—and, back downstairs, another preserved treasure: a 1908 Stanley Steamer Model K. One of the last of its kind in the world, the Model K could easily run over 100 mph and held the land speed record. Mr Shanklin told us the story of a centennial race he attended, and just like it did a hundred years ago, the Model K beats the pants off of the competition. Before heading home, we made sure that everyone had had a chance to play the organ, took a look at the Mason & Hamlin / Ampico player piano (yet another last-of-its-kind masterpiece in impeccable condition), and chatted about some of the fun events that have been hosted in Shanklin Music Hall. With our adieus and farewells bade, and a lunch stop for pizza, we wound our way home.